Mark 4:30-32 And he said, Whereunto shall we liken the kingdom of God? or with what comparison shall we compare it? It is like a grain of mustard seed, which, when it is sown in the earth, is less than all the seeds that be in the earth: But when it is sown, it groweth up, and becometh greater than all herbs, and shooteth out great branches; so that the fowls of the air may lodge under the shadow of it. Luke 13:18-19 Then said he, Unto what is the kingdom of God like? and whereunto shall I resemble it? 19 It is like a grain of mustard seed, which a man took, and cast into his garden; and it grew, and waxed a great tree; and the fowls of the air lodged in the branches of it. Obviously these are the same story as accounted in the different gospels, but they reveal something. They are not talking about the size of the mustard seed, but the uniqueness of such a tiny herbal seed and how it grows. I did a little studying on mustard and here are what I believe Jesus was talking about. The mustard plant has is one of the smallest seeds that are planted by farmers (obviously not the smallest seed of any plant) at 1/8 inch in diameter. The mustard seed, once planted, begins (noticeably) to grow the very next day. In fact it is one of the quickest maturing plants around reaching full maturity in about 40 days. I believe that God used this plant as an example of our faith in that once we receive Christ, our faith begins to grow immediately. The number forty in the Bible points to tribulation or trials (Israel in the wilderness for 40 years) which would speak of a definite maturing process for our faith (part of growth and maturity come from overcoming trials in our life). When mature, the mustard plant is much larger than any of the other herbs which could speak to our faith having the potential to grow beyond that of others. So “faith as a mustard seed” to move mountains I believe refers not to just a little faith can move a mountain, but rather that a faith that is growing and maturing, though it started with a small beginning, will give you the ability to move mountains (overcome trials). Kudos on thinking outside of the normal Christian box on this one. I think this is a very interesting way of thinking of it and am going to do some research on my own on the subject because I am very interested in the relationship between faith and the Holy Spirit. Thanks for such a huge insight! These are great thoughts mooney. I just on this subject myself, for the parable in St. Mark’s gospel. Hey everyone, thanks for your comments. I will definitely check out the articles you mention. Great insights. It is a fresh way of viewing it, thank you. 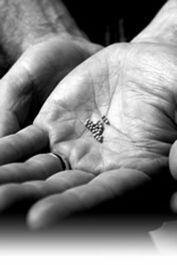 The way I had always thought of these parables is the whole ‘God uses the weak and lowly of the world to accomplish his big plans and shame the wise and powerful.’ aka, the least of all the seeds, the mustard seed, is the one that Jesus uses, and that most closely resembles the kingdom of God. I really liked the research you did. I didn’t realize how fast mustard plants grew. very intriguing. I’m interested in learning more, we’ll see what my own research digs up. I am in agreement with you about the mustard seed. I believe that it is not the size, but the fact that it grows in such a short span of time. If this scripture refers to the size, the the kingdom of God is awfully small. People tend to leave out the reference to the kingdom of God. I think it is becasue then they may not be included in the kingdom due to the size of it. May God bless you and keep you in perfect peace.